C-Line's long lasting and stylish biodegradable reusable extra large poly envelopes will make your projects extremely easy and organize. The strong, acid-free archival quality polypropylene envelope designed to keep sensitive documents free from any type of damages. Polypropylene material means there are no photocopy transfer giving the best protection for your hard work. A hook-and-loop closure feature firmly secure all documents inside. These poly envelopes are capable to hold documents up to 11 x 8 1/2" along with an easy access top-loading mechanism. ASTM testing certified product indicating this product will biodegrade in two to five years when buried in an anaerobic landfill. Go green today with these C-Line Clear Biodegradable Reusable XL Poly Envelopes w/ Hook and Loop Closure! Insert Size: 11 x 8 1/2"
Great Product Review by Pat C.
Really happy with the Clear Poly Envelopes. We have ordered them yearly now for 4 years for our large annual prayer conferences. We put in all the conference information/materials that we want each attending person to have over the weekend. With the Velcro clasp, the materials will not fall out. They stack very nicely when full, and is very easy to hand to a person at registration time. Each time of order, the shipping has been very speedy, usually is here within 4-5 business days. Very happy with the ordering/receiving process. C-Line Clear Biodegradable Poly Envelope w/ Velcro Closure -5/PK, Review by Sheryl B.
I absolutely Love these clear envelopes. They are quite sturdy and not likely to crack like the inexpensive ones one finds at local stores. I have used them to organize my file drawers. They hold an ample amount of papers and are also useful in filing things such as ID's etc.. They also come in handy when transporting document in the car etc... A great product and would definitely purchase them again. size it perfect as well. and a bit larger than the string closure pockets. C-Line Clear Biodegradable Poly Envelope w/ Velcro Closure -5/PK Review by Sheryl B. Absolutely Love these clear Poly envelopes! They are very well made not like the thinner ones from regular office stores. They are terrific for organizing papers in files. Look at Alejandra organizing website and this is where I got the idea to organize my files with these. Great Quality Well Made. would BUY again! We use this product on Review by Debra T.
We use this product on an ongoing basis. The product works very well for our clients needs. The previous order to this one was delayed considerably and I had a difficult time getting information as to when we could expect them. the order was placed on 6/2 and as of today 7/20, we still have not received the order. I spoke with someone on Friday and was finally able to ascertain that they would ship today. I am not sure why it has taken so long to get product shipped. Transcript: "This is C-Line Clear Biodegradable Poly Envelopes with Velcro Closures. It's a clear plastic envelope that fits your standard sized paper, 11 x 8.5 inches, and seals nicely with velcro. Because it is plastic, it means it is conveniently water resistant. Please do not submerge it in water though. It does offer some protection because it does not tear easily. But it does cut very easily, and rips easily from that point. So don't cut it, and your documents will be nice and secure, well as secure as a CLEAR resealable envelope can get. 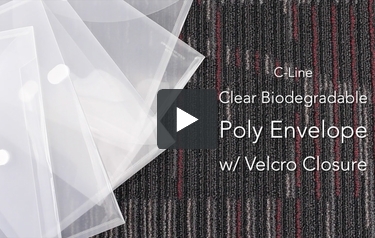 "This is C-Line Clear Biodegradable Poly Envelopes with Velcro Closures. It can hold a pretty decent amount of a pages and documents, though C-line does offer ones that open up to fit even more if that's what you are looking for. And if you like coupons and weekly deals, be sure to sign up to our weekly email! There are no articles about the exciting world of binding, just savings!"